The Audience module allows Video Cloud to synchronize viewing data from Audience-enabled Brightcove Players to popular marketing automation platforms. The Audience module can also be configured with a custom integration. With a custom integration, viewing data is saved locally in Video Cloud and the Audience API is used to programmatically extract the data. Follow these steps to configure a custom integration. Select Custom as the integration. The custom connection is now set up and ready to use. Once the connection has been made, you can configure the integration. By default, the Connection Status will be Enabled. The Connection Status determines if Video Cloud video engagement data is saved. Select a data retention policy. The data retention policy determines how long the viewing data and lead form data (if using an Audience lead form) will be retained in your Video Cloud account. 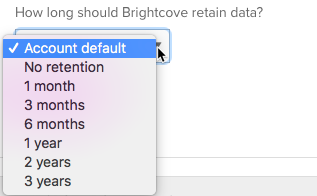 Note: If you select No retention, NO data will be saved. When you use the API to download data, there won’t be any. Video engagement data will only be saved when you are using an Audience-enabled video player. For information on creating an Audience-enabled Brightcove Player, see Creating an Audience-enabled Player. These values can be passed in via URL parameters or through the player embed code. For viewer tracking to occur, the user id should be passed as a URL parameter on the page that is displaying the video. The known user parameter is required for lead forms (if you'd like the lead form to conditionally display for unknown viewers). Note: In order for the player/plugin to read the URL parameters, the Advanced (in-page) embed code should be used. The Standard (iframe) embed code will not work as the plugin will be running inside of an iframe and therefore is unable to access the parent page URL which has the parameter. Viewer Activities (Events) - Provided as part of the Audience module, this option can be used to view video data inside the Audience module. For information, see Viewing Player Events in the Audience Module. Export Data - Provided as part of the Audience module, this option can be used to export video view and lead data. For information, see Exporting Data from the Audience Module.